Norwegians have never bought as much white wine as in 2018. The very most popular was Laroche Chardonnay L from France.This wine is a perfect match for Norwegians’ taste in wines, according to wine expert Marianne Tyldum at Arcus. “We Norwegians like dry, fresh wines. This is the perfect wine to serve as an aperitif by the seaside, or up in the mountain cabins. The fresh, fruity taste of Laroche Chardonnay L is perfect for light, everyday meals, and for all types of seafood, including sushi,” says Tyldum. Michael Holm Johansen, Chairman of the Board of Directors at Arcus ASA, has 13 December 2018 bought 6,300 shares in Arcus ASA at a price of NOK 41.00 per share.Following this transaction, Michael Holm Johansen owns 156,300 shares in Arcus ASA. www.linie.com/liveMany people doubt the fact that every drop of LINIE has matured four months at sea, crossing the equator twice. Now, for the first time, LINIE is live-streaming its sea journey around the world to prove its authenticity. The Norwegian Aquavit Festival is being held in Gjøvik for the 8th year in a row. The Festival is based on a product that Arcus has historical ownership of, and the number of visitors is expected to break previous records.30 years ago we could choose from 10 different aquavits - now Arcus has 75 varieties on offer. At the Aquavit Festival one may taste the most popular aquavits – and the most unique ones. 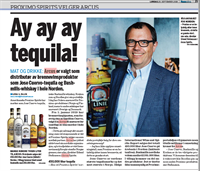 Arcus begins Nordic distribution of the world’s best selling tequilaProximo is one of the leading global spirits players, most famous for distributing Jose Cuervo Tequila, the world’s best-selling and oldest tequila brand with a heritage tracing back to 1795. In addition to Cuervo, Arcus will also sell Bushmills Irish Whiskey, the third largest Irish whiskey in the world, and The Kraken Black Spiced Rum, one of world’s most dynamic and fastest growing rum brands. Proximo’s distribution arrangements with Arcus cover all Nordic markets including the duty free and travel retail channels.